Cupcakes 'n Daisies: Handwork Update . . . . So back in March, I blogged about how I was looking for something to work on outside my sewing room, something I could take with me in the car and on trips, or have in my lap while watching TV with my husband in the evening. I thought Hocuspocusville was going to be the answer, part handwork part sewing, but I could tell right off, that was not the project for me. Several folks left comments that I should try working with hexagons. 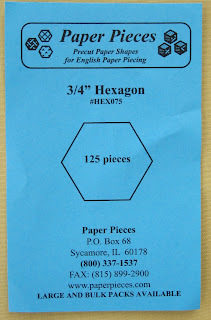 I did a little research on English Paper Piecing and basically felt making all the hexagons would be fun, but wasn't so sure I would ever make anything with them.....kind of like those yo yos. So I'm mulling over the whole hexagon thing and then, I remember, I have these . . . . .
28 hexagon blocks made by my Mamaw, just sitting in her old sewing basket, that my Mom had given me ages back, way before I even ever thought about quilting!! These blocks are well over 40 years old, cut and pieced by hand, the seams are maybe 1/8 of an inch wide. So I dig around in my sewing room and find the blocks. And at first I wasn't so excited about the prospect of actually making something with them. I loved that the blocks were made by my grandmother, but the fabric, not really my thing, and the white blocks around the edges, no longer white, or even close to white. I took this picture of two of the blocks laying on white fabric. So I did some research on the internet and found that perhaps the blocks could be brought back to life. The blocks are very fragile so I weighed the possibility of ruining the blocks against never using the blocks, just keeping them in the old sewing basket. I decided to risk two blocks. In my kitchen sink I soaked two blocks in hot water with 3/4 cup of oxy clean for 2 hours. I then carefully rinsed and soaked them 20 minutes in white vinegar. Finally, I soaked them for 15 minutes in plain cold water. This is the after shot of those yellowed looking blocks......they look as good as new. I feel like I've won the lottery, these blocks are priceless to me. Since the blocks are made by hand, they don't fit together, which is why I suspect Mamaw didn't make a quilt from them. So I've decided to attach them to squares of fabric, that will also help protect them, make them less fragile. This the the back, I'm using the paper pieces to help me turn and baste the tiny edge around each block. Then I will attach them to fabric. I'm also making some blocks of my own. Right now there's no master plan, other than making my blocks with the same yellow center and same design, yellow center, solid fabric, floral fabric, white border. The top hexie is the size of Mamaw's, 3/4 an inch...I'm practicing on those, once I'm good with the bigger size I'll drop down to the medium size, then the small. Something that helps me work on these pieces is this light I wear around my neck. It's light, bright and portable. I carry all my hexagon supplies in my Mothers Day floral arrangement basket. I just love being able to pick up the basket and carry it from room to room, and just having a sewing basket in general! So in addition to being thrilled with the prospect of finally getting Mamaw's blocks out of the closet and into a quilt, I love making the hexagons myself. It's a very relaxing way to end each day. What a great project! I'm so glad you were able to rescue those blocks. So true about one door opening when another closes. wow this will be quite a project! How cool to have those blocks of your mothers and that you're able to use them. I spent this morning basting hexies, something I never, every thought I would do. I'm addicted. It's the perfect project to take with me when I have to wait for the kids, etc!! WHat a lovely post to read this morning! So glad the blocks washed up well and that you are inspired to turn them into something. I have a friend who makes things from those teeny tiny hexies and they are adorable! Enjoy! This is such an exciting post, Thelma. Your Mamaw is smiling just as big as you are. Enjoy and stitch with a happy heart. What a special quilt to be part from your grandmother and part 2 generations later from you. The hexie flowers are very beautiful. What a great post. I'm glad you've pulled the blocks out from the deep, dark recesses of the closet. You'll be happy one day when you have a beautiful, finished project full of memories. What a fantastic and special project. Thank you for the tip about whitening up yellowed white fabric safely. What a wonderful project! And how precious that the craft continues through the generations. This will be one very special piece when it is finished. since these are such special blocks and I do cherish anything made by previous generations, how about getting them framed? that way you could spread the love and give them to your brothers and mother too! they would look great on a dark backgroud to make them stand out. just an idea! Great hexagons. So wonderful that you were able to save them. When you get this done, it will be a very special quilt. It won't be what you would normally make left to your own devices, but it will be full of memories and will be a link back to your own family history. You are so right to do this - I can't wait to see how they turn out!!! I think you were very brave to wash them! I'm not sure I would have dared!! 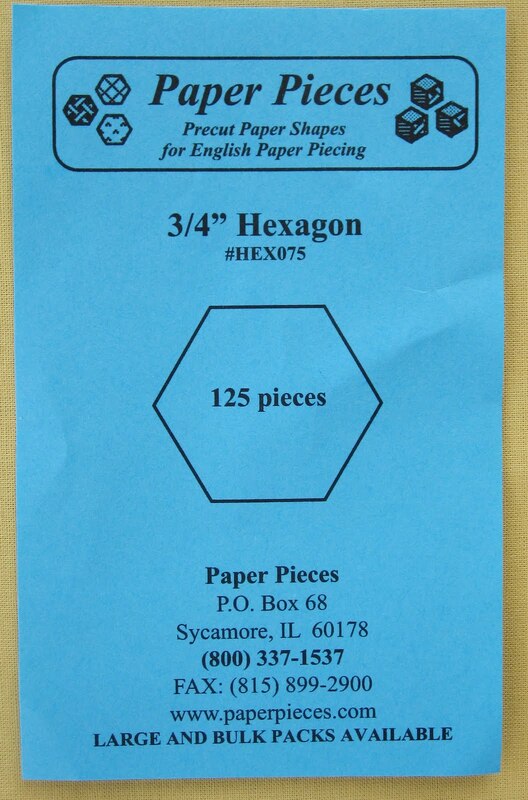 I am using the 1-inch hexies from Paperpieces as well. I really like using them - they 'give' when I need to bend a little to connect the sides. I have about 38 flowers done.... hoping to start putting them into a top soon. I need 130 total.... told my kids this is a once in a lifetime quilt.